We had a very nice dinner at Harry's of St. Augustine on a recent Sunday evening. We'd eaten here before and enjoyed it, and this second visit confirmed the verdict: very good food in a very nice atmosphere! There were, however, one or two missteps in the service, but the good food made up for that. Harry's is always busy, and we arrived to a 30-45 minute wait to sit inside--or immediate sitting outside on the gorgeous patio during a beautiful spring evening--that was a no brainer! We quickly were seated and provided menus. 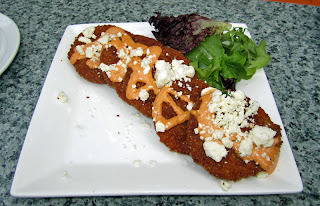 We started out with an order of the Fried Green Tomatoes. Tommy pronounced them to be the best fried green tomatoes he's ever eaten (he must have forgotten about the ones I've made him....). In reality, they were very good. A nice and crispy cormeal crust covered the tomatoes which were nice and solid, slightly acid, and very good. The aioli and feta cheese that garnished them only added to the great layers of flavors. Indeed, these were among the best fried green tomatoes that I've ever had. After this we ordered dinner. Tommy ordered soup which, unfortunately, never arrived. When dinner came, no soup had appeared. 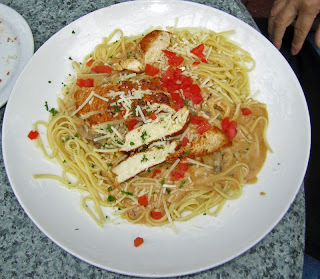 But his dinner did arrive and it was very good: Chicken and pasta. The pasta was nicely cooked, just al dente. The chicken was exceedingly tender and the sauce nice and creamy. However, he did have to ask for some parmesan--it really should have been offered with the dinner. However, the waiter did not bring the dinner, a runner did. But when asked for some Parmesan, the waiter said sure, but then proceeded to start to take an order at a nearby table--there was no real sense of urgency on his part. His attitude seemed a bit cavalier, almost like he was doing us a favor by serving us, that was a bit offputting. But we did get the parmesan and, in all honesty, the food was really good. 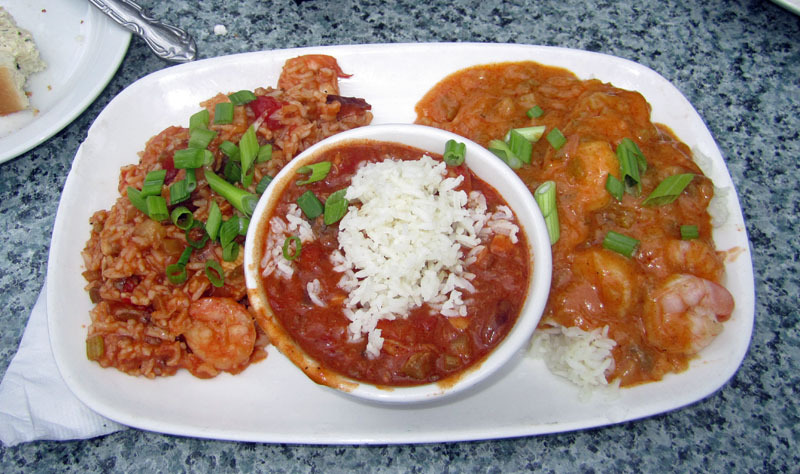 I had the Taste of New Orleans for my main course and it as a large plate with large portions and large flavor. First, there was jambalaya, nice with a bit of spice. Then there was Shrimp Etouffe--very good. Finally, there was gumbo. Boy oh boy, all of these were very good. A bit of spice, a bit of heat, but they were all they should be with shrimp, seafood, andoullie, spice, and rice. A real taste of New Orleans and I enjoyed it a lot. The somewhat "off" service notwithstanding, we enjoyed our meal and time at Harrys. The food is really good and we'd both go back here in a heartbeat. I'm sure we'll return--soon! Thank you so much for dining with us and your review! We really do hope you can come visit us again. If you have any additional questions about Harry's, please don't hesitate to reach out to me. Thanks again!